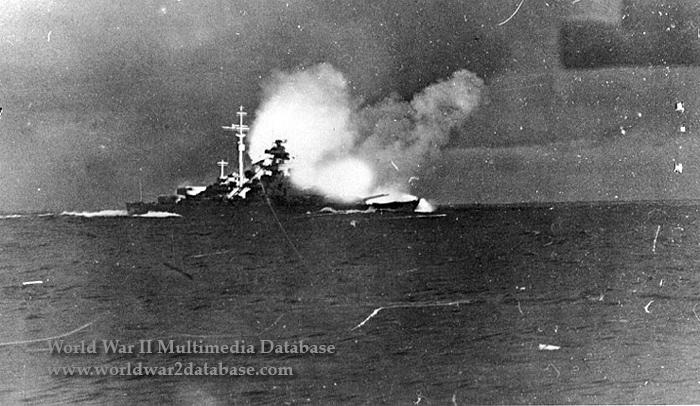 Deutsche Kriegsmarine (German Navy) battleship Bismarck fires her last salvo at HMS Prince of Wales during the Battle of the Denmark Strait on May 24, 1941. Taken from DKM Prinz Eugen. HMS Hood had already been sunk by Bismarck and DKM Prinz Eugen. Prinz Eugen's main 203mm (8-inch) guns are visible in the upper right of this view. Bismarck is taking on water from a hit to her bow by Prince of Wales as after turrets "Caesar" and "Dora" fire back around 0608 Hours. Prince of Wales was hit by German fire repeatedly - Bismarck hit three times and Prinz Eugen four times - and had heavy damage to her superstructure. She started flooding from holes in her waterline. Electrical failures caused her main battery to be temporarily inoperable. Prince of Wales left the action at 0609. Bismarck fired 93 armor-piercing shells against the British ships and Prinz Eugen fired 179 armor-piercing and high-explosive shells. Bismarck, down by the bows, was trailing oil. Still, she was able to maintain 28 knots (51.9 kilometers per hour) with HMS Suffolk, HMS Norfolk and Prince of Wales in pursuit at 40,000 meters (24.8 miles) distance. At 1814 Hours, the Bismarck, still damaged, engaged Suffolk and Prince of Wales again so that the undamaged Prinz Eugen could separate and continue her mission of commerce raiding. Neither the British nor Bismarck scored any hits.